There are some days that I just feel like I cannot get anything accomplished. Do y’all have that issue? Today it was trying to get some sewing done. I have my Labor Day Weekend Goals set up. Friday night I did manage to finish putting together the blocks for the Star Surround Quilt Along. Notice I said “finish the blocks” not “finish the top.” I figured I still have two weeks to finish the top so I would try to catch up on the other projects that have been ignored during this busy first week of school. Isn’t she pretty? I know she isn’t exactly a classic, but I love her style and her color and when I found her on Craigslist I fell in love with her. She’s a White, Model 425, and her previous owner didn’t really do much sewing. When I tested her at the person’s house, her daughter explained that her mom didn’t sew much, really just used it to do some mending and things. She worked fine there, but I wanted to check her out anyway. Since my main machine is out of commission and I’m using my travel machine right now, that was the first one that got worked on. I opened her up and cleaned her all out, and she’s working great again. Then I moved on to the new to me machine. First up was the bobbin casing. It wasn’t too bad and I got it taken apart, cleaned, and oiled pretty quickly (after I found an owner’s manual online). Then I moved on to the upper part. I opened it up and it looked like some weird wax buildup all over the place. One clean, soft cloth and some machine oil, a little elbow grease, and that was all cleaned up too. 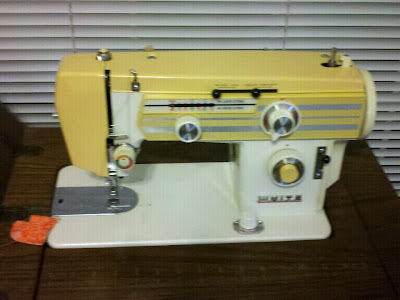 I took off the old needle and threaded a new one, plugged it all back in, and the machine starts sewing all on its own. Okay. Unplug it, back up, and try to figure out why. No clue. Switch the plugs around and it seems to be okay. Apparently one of the sockets makes it sew on its own and the other doesn’t. Okay. Gotta love it. I can work with that. Finally I get it to the point that I can test the machine. I put the fabric under the presser foot and BAM! The light bulb explodes and scares the crap out of me!! So I figure I’ll buy another light bulb but let’s test the machine. Press on the foot pedal and nothing. So…..after I fixed the breaker, got the machine up and working, I returned to piecing the QOV Mystery Quilt. But that wasn’t working either. About halfway through, I find that something is off, either the cutting instructions, the sewing instructions, something is off. Its just not coming together as it should. I skipped the block that is the issue and emailed the designer with my questions. Did manage to finish the rest of the step and start cutting for step four. But I still feel like I got nothing done today. How about y’all? How has your sewing weekend gone? 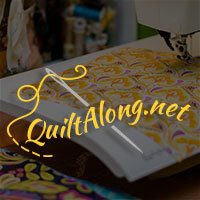 Linking up with Val for Tuesday Archives at Val's Quilting Studio. I have sewing days like this myself! Just today I broke a needle and it took me five minutes to change it...it is in my fairly new to me Singer 99 and the needle doesn't go in the center, but slightly left of center, who knew? Oh my...I think we all do have days like that sometimes....and I tell myself to just walk away....LOL!!! I love your little vintage yellow machine. HOW FUN!!!! It has so much character!